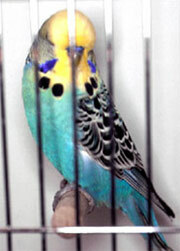 I started raising show quality English budgerigars in early 1963 but didn't show any birds until 1964 as a novice. The birds I started with had Moffat and Bryan in their background. In 1966 I was forced to sell my birds to purchase my first house and start raising a family. Over the next two decades I was fortunate enough to raise both Great Danes with dogs ranked in the top 10 in the USA in both 1973 and 1974 and also Arabian horses for a short period of time. I never forgot my experiences and enjoyment with budgies and in 1995 while on a business trip in Florida, I saw my first English Budgies in 29 years. I purchased two pair and brought them back to Los Angeles. I tried breeding them in cages in my living room to no avail, but I was hooked again. Over the next year I bought over one hundred and twenty birds from a number of good breeders. In addition, I bred over 520 young in 1996 from 55 pair. While some of the young were quite nice I wasn't happy with the percentage or consistency of quality. I made up my mind to visit a number of champion breeders in Europe and did so in late 1996 and during the spring and fall of 1997. During 3 of my 4 trips I purchased another 28 birds. 15 came from Jo Mannes in Germany and 6 from Jos Backx in Belgium. Along with about 8 birds from Bob Whitham in Malibu,California my stud today is almost 100% Jo Mannes blood with a little of Jos Backx. All of the other blood except for one bird I bred in 1997 from an intermediate hobbyist has been systematically eliminated. 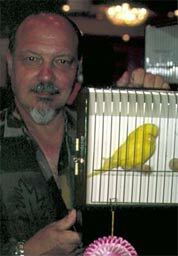 American Budgerigar Society's "Novice of the Year". In 1999 I was the ABS's "Intermediate of the Year", also showing in only 5 shows. In 2000 I only showed a couple of times due to business commitments and having to move my aviary do to neighbor problems. As a Champion I've placed birds in the top 10 in these shows. They were for the most part babies bred in 2000. My true love is breeding and watching young budgies develop. My passions are power and elegance, a difficult combination. My favorite varieties and or colors are greys, dark factors and spangles in all colors. And my hope is that budgerigar breeders all over the world to share, cooperate and promote all aspects of the wonderful hobby of budgerigar breeding and exhibiting.